Ah, the lovely fabrics you can find in the remnants bin at Walmart... I can actually say "I crafted this today" about this project. 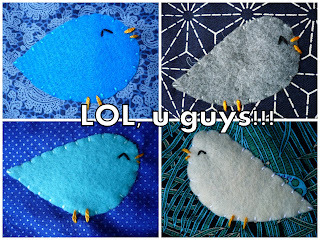 I'm starting to get te hang of the sewing machine, slowly. I hope I'm not speaking too soon, but I think I could actually get pretty decent at sewing. I just need to learn to keep my cool. I actually screwed this up by sewing the wrist strap in backwards, so it would be sticking out the INSIDE instead of the right way. Luckily, my husband, in his infinite wisdom, told me to get a seam ripper while at the fabric store this weekend, so I didn't have to curse the world and my sewing machine... I fixed it, and I'm glad for it. The inside isn't anything to have a party over, but it's not bad, right? No frills, no gimmicks. I just may make a few more of these for swaps, friends, fam, whatev... I need some other good ideas of small-sized projects to help me improve my sewing skills. I'm thinking headbands next. I use headbands. Here's another project I came across while going through digital photos on my computer...I painted this for a friend's recording studio about a year ago. I started out with a canvas that I had painted a random texture onto in lots of layers to look sort of tie-dyed, then used that grid method (whatever it's called) to sketch the image on the canvas for painting. It took a few days, but it was pretty fun. Turned out pretty cool. Here's another round of old projects! 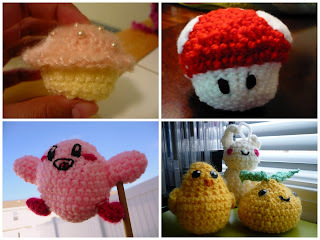 This time the theme is crocheted amigurumi! This guy is about the size of a large pummello grapefruit. His body was originally going to be the abdomen of a big yellow spider, but I got sick of the yarn color and just wanted the project to be done, so I turned him into a little fox! 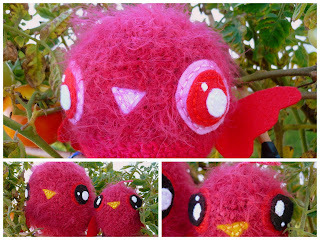 Here are three little red birds. I used Modea Dream Yarn, and boy is it so soft. Perfect for baby chick feathers. Here are some miscellaneous other old projects. The most recent of which I made friday evening, the pink cupcake! Sometimes I start with patterns from the book Amigurumi World, but I usually get sick of counting and just end up wingin' it. I made 3 different rounds of eight charms each for a total of 24 styles of lols. I totally love lolcats. I think they are so funny. My favorite is "I HAS A HAPPY". 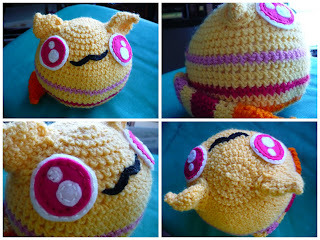 I sold a bunch of these on Etsy initially, but sales have seriously slowed. My intitial thoughts on Etsy that it was too much work for too little gratification. Maybe I was right. I don't really keep my shop stocked, but at least it's there as a tool when people from craftster want some of my crap! I always thought it would be funner to get a booth at a craft fair! I made this cute lil fella on Wednesday. It's made with the basic technique of "toothbrush" rugmaking. It's called that because traditionally, the tool you use to make this rug is a sawed off toothbrush handle. It's kinda melted and shaped to be a big ol' needle. There are some good instructions on ragrugcafe.com. That's where I learned a few months ago. This jigglypuff took about 2.5 yards of pink cotton fabric, then I fashioned his eyes, mouth, and ear-blackness out of leftover fleece scraps and felt. I was thiiiinking about handsewing these details on, but after handstitching the eyes together, I thought, "meh" and just used the hot glue gun. I took it to mutual along with some other crafts, because the yw were having a planning meeting to figure out what things they would like to do for Wednesday night activities. It was a hit, so the girls want to make these things on July 8th. Hopefully I can be a good teacher! So, for now, this puff must remain unused to be an example...he will eventually find his way to just outside my bathroom shower. So ignore my HORRIBLY MESSY craftroom for a second and check out this ridiculous formal dress from the 70's or 80's. The story goes, that I have had my eye on these two particular sequined monstrocities for months now at the thrift store. I was there on Monday to browse, and had to ask, "Do y'all ever have sales?" to which the super-friendly cashier, Tina, responded that since they are so short staffed, they haven't been able to keep up cycling out the merchandise and clearancing stale goods, but asked me what I was looking for. I told her about me lurking these dresses for a while now, and she was SO NICE! She took the dresses aside and told me to call the store in the morning, she would ask her supervisor if she would mark them down. Apparently they had been on the rack since February. LO! Behold! I called back, the dresses were marked down 50% off! I bought them for $7.50 each! My original purpose for these was to tear them down and reconstruct into multiple handbags with stitched-on felt designs. This dress, however, I think I love. Unfortunately, it does not zip fully, as the dress is a size 8, and my booty is decidedly still a size 12. I could be size 8 again if I lost a measly 15-20 lbs... Easier said than done. I love my eats. But I figure, it's hard to find a modest formal dress, and what if I need one some day, for a princess ball or (more likely) a cruise?! No, I sha'nt be destroying THIS dress. THIS one, however, will meet the scizzors. It's such a great color with such intense sequining. Ah, it would look so good on stage. My stage days are over, though, so be afraid, teal-sparkle-dress, be very afraid! GRATUITOUS SEQUIN SHOT!!!! Wouldn't this look sooo good as a handbag wif mermaid or shark motif?! 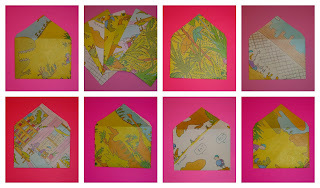 Envelopes reconstructed from the children's book DINOSAUR GARDEN. They are little, notecard-sized envelopes. Good for writing letters! Two stuffies, one's a stegosaurus, the other is a triceratops. I hand-sewed the stego, for fear of the sewing machine, but got brave and did the triceratops on the sewing machine. I totally rule. This is a shrinky dink necklace with all the super0cute dino-designs I drew. I accented the charms with swarovsky rhinestones. Since I had to send the necklace off to my swap partner, I HAD to make another set of charms. This set is slightly smaller. Here's a set of watercolor paintings inspired by the artwork of Morgan O'Brien. I was really pleased with the stego. Lastly, a pop-up notecard with a watercolor-painted stegosaurus. Says, "brontosaurus loves you..." Aw.